After the last decision by Microsoft to cut 2300 jobs in Finland, and 7 800 jobs in the world (7% of its workforce), 2 300 families are in trouble in Finland, and it looks like the hit on Salo is going to be huge. That apparently gave a good reason for Minister Jari Lindström, member of the Finns’ party, to avoid going to Brussels discuss with his colleagues ministers from the EU countries to exchange on refugees resettlement, which looks a little strange as one more day at work for the Minister is probably not going to help the 2300 persons who received and end-of-contract notice. This is the last episode of the Nokia-Microsoft saga in Finland. The story began in 2010, when Stefan Elop was chosen as CEO of Nokia. From January 2008 to September 2010, Elop, a Canadian engineer, after a successful career in other campanies, worked for Microsoft as the head of the Business Division, responsible for the Microsoft Office and Microsoft Dynamics line of products, and as a member of the company’s senior leadership team. According to Wikipedia, “one big accomplishment Elop is credited with is pushing Microsoft to develop cloud-based versions of the company’s programs. This move was noted as one that helped Microsoft maintain its dominance, while holding off start-ups looking to disrupt its traditional business model“. When he was chosen as CEO in September 2010, he replaced a line of Finnish CEOs, and he was facing the challenge of modernising a company which was in serious difficulties due in particular to a lack of investments in the field of smart phones, but was still one of the leaders of the market for the mobile phones.With Elop, who got a $6 million signing bonus, Nokia annual revenues fell in 2 years 40% from EUR 41.7 billions per year to EUR 25.3 billions per year, its profits fell 92%, and 21 000 staff members were laid off. Then in September 2013, Nokia’s mobile phone and devices business was sold to Microsoft 5.4 billion euros ($7.2 billion dollars), which was good news for the Nokia shareholders. Elop went back to work for Microsoft, with a comfortable bonus (18,8 millions euros). The main remaining activities of Nokia were in the field of telecom networks. Nokia used this money to buy a smaller French rival in the field of networks, Alcatel-Lucent , in a 15.6 billion Euro ($16.6 billion) all-stock deal. According to Forbes, the combined entity, called Nokia Corporation, is the second largest mobile equipment manufacturer in the world with an estimated market share of 35%, close behind Swedish giant Ericsson which has an estimated 40% share, and Chinese competitors close behind. This operation has been diversely appreciated, as it is quite unlikely that the new company will be very fast integrated, but it should be stable for now, until at least the development of the Chinese competitors. So now Microsoft seems to have been unable to develop the mobile phone branch of Nokia, even if it took 3 to 4 % of the global market of smart phones. It has written down about $7.6 billion related to its Nokia phone business. So if Microsoft would not have bought the Nokia’s mobile phone and devices business, Nokia would have continued, and certainly gone down faster than Microsoft , because it had not the same marketing capacities. The whole of Nokia may have been oblige to fine for bankruptcy, and there would be some more thousands of people without a job. In addition, Nokia would not have been able to buy Alcatel-Lucent and become a leader in Telecom networks. But the main problem is not here: if you have a look at the figures concerning the share of high technology products in EU countries exportations (click here), the average in the EU stayed around 16 % in the last 7 years. It has been stable at the level of 14 % in Germany, 20 % in France, 13 % in Sweden, 16 % in the UK. It went up from 8 % to 16 % in Estonia. And it went down from 17,3 % to 6,6 % in Finland, and it is not only the Nokia effect, with Finland being now in a group with Romania, Lithuania, Croatia, Italy, Spain, Greece and Bulgaria. So the main worry of Minister Lindström and of the government should not be only to take care of the people laid off in Salo, but mainly to change Finland’s industrial strategy. 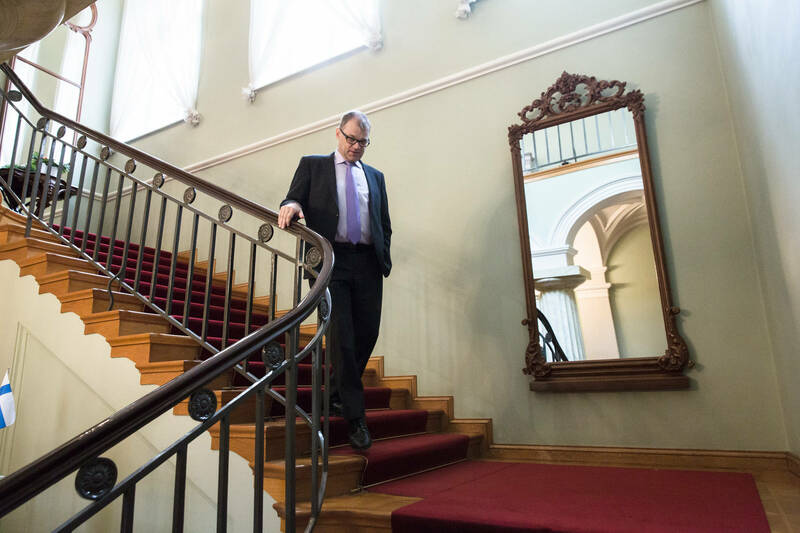 The government programme is quite far away from it, and it should be a priority for Juha Sipilä. The choice is quite large, from the environmental technology to the biology sector, the clean air and clean water technologies, or the domains of robotics or energy grids and networks. With thousands of engineers unemployed, it would be possible. There are some interesting examples to follow in other countries to make this strange Finnish lethargy disappear. Estonia did great in the last years (see the article”How did Estonia become a leader in technology?” from The Economist). It seems that there is also the question of the mindset, which is not an easy thing to change (Click here for an interesting US article on Estonia success). There are also other approaches, like in France which is for the moment leading in the EU in terms of the percentage of high-tech exports, or in Germany, where the state is playing an active role in the development of a strategy for the industry (think Airbus for example, or the fast trains developments).